When planning your summer vacation, take along the 2017 RAV4 as a travel guide. Some places are just more fun to visit when you’re off the beaten path. From mountaintop to river shore, the RAV4 is ready to take you where the fun is, and the journey along the way can be just as exciting as the destination. The RAV4 is made for play, and since your time is valuable, it is designed to help you get the most from every vacation or downtime available. 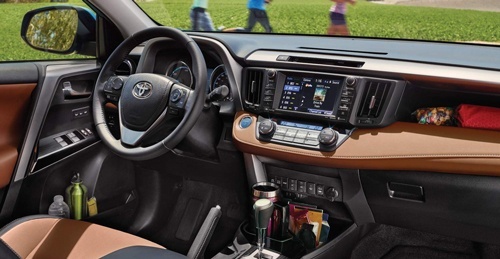 The 2017 RAV4’s handling and comfortable interior make the journey pleasurable. This SUV offers an interior that helps you feel right at home. The 8-way power adjustable driver’s seat on select models makes it easy for you to settle in for a long trip. The front bucket seats are heated for those cold mornings, and bolstered to hug you in place. Optional dual-zone climate controls let you and your passenger make adjustments to the temperature in your space. Toyota gave drivers a list of assistance features for this year’s model. Standard equipment now includes lane departure warning, adaptive cruise control, a forward collision mitigation system and automatic high beams as part of the Toyota Safety Sense system. All of these features help to keep the safety awards rolling in on any number of their models. The RAV4 was a 2016 Insurance Institute for Highway Safety Top Safety Pick + when equipped with the front crash prevention technology. Another new rollout for 2017 is the Platinum Package. Toyota knows that you want style and class in your SUV, so they are now offering the Platinum Package that is bursting with features to make your drive more pleasant. The AWD offers better traction and control while on the road, and all five doors have a smart entry system for quick getaways. The power rear liftgate comes with a hands-free technology that opens for you, which is incredibly handy when you have your arms filled with shopping bags or sporting equipment. The exterior of the Platinum Package is complete with full body colour, including the side mirrors and the bumper mouldings on the front and rear. There is badging on the carpet mat, the rear door and on the doorsill plates. Toyota installed a heated steering wheel, a bird’s-eye-view camera and a premium audio system so you can enjoy all of your favourite sounds. Ambient floor lighting helps set the mood as you travel. The 2017 Toyota RAV4 is a versatile SUV that comes in a range of models that are made to suit a variety of lifestyles. 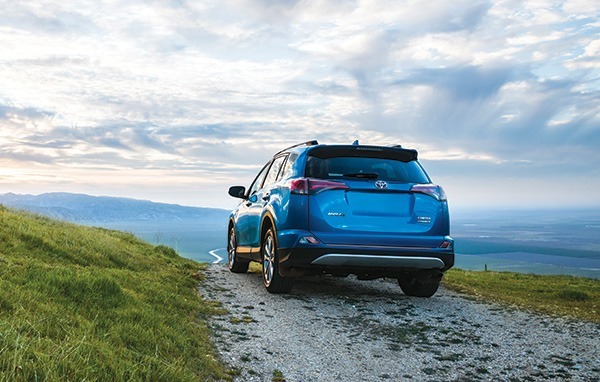 From Front Wheel Drive to the Hybrid model, the RAV4 is made for travel. The cargo area is designed for flexibility. With the 60/40 split seats folded down, the floor becomes a flat load floor that lets you slide bikes, televisions, golf clubs and even dog carriers in the 2,080 litres of cargo area. Bring everyone with you when you go. It also gives you a tailgate to sit on when you need a break or to change your hiking boots. Fuel consumption is anywhere from 10.0/7.8/9.0 city highway and combined to 10.7/8.4/9.7 L/100km depending upon which model you choose. When making your summer plans, plan to stop by and see us for a walk around the new 2017 Toyota RAV4. Make us one of your first stops on your vacation.